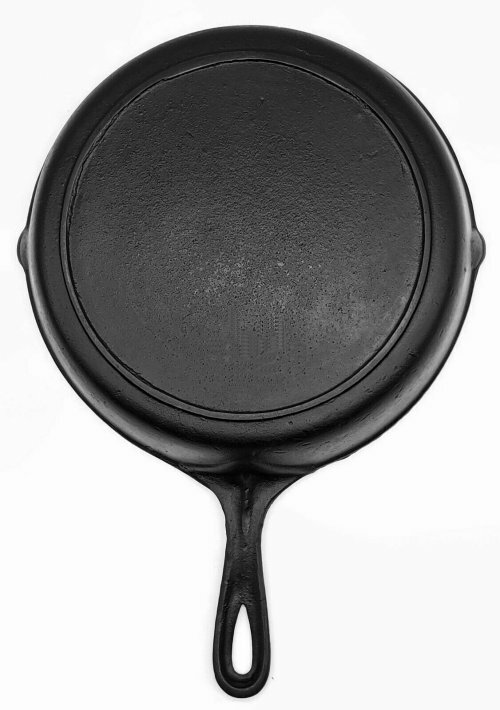 Part of the allure of vintage cast iron, besides the fineness of the castings, are the unique trademarks and detail work the foundries of the past cast into each piece they produced. 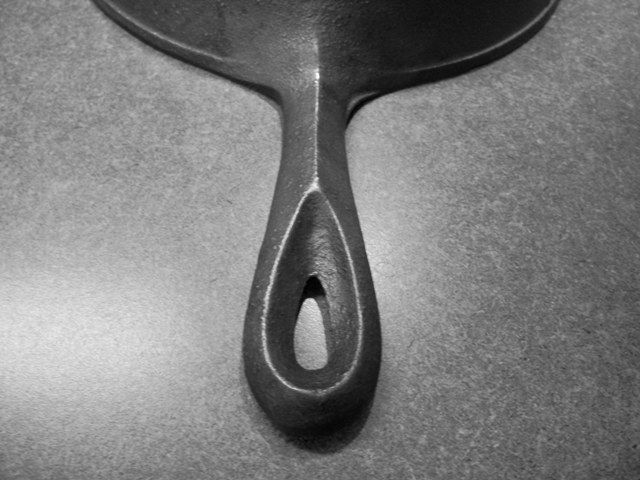 Pattern makers were both skilled craftsmen and artists, in some cases even carving small, unique figures ("maker's marks") into their work to identify themselves. 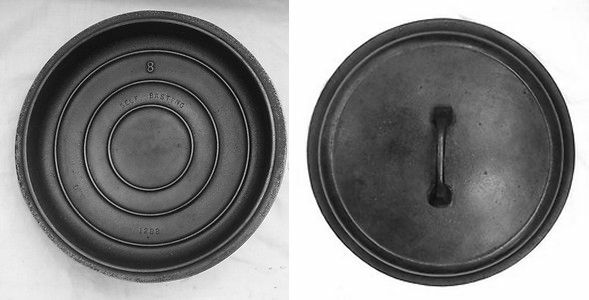 There are instances, however, where the parentage of some 20th century cast iron ware seems mysteriously unclear. 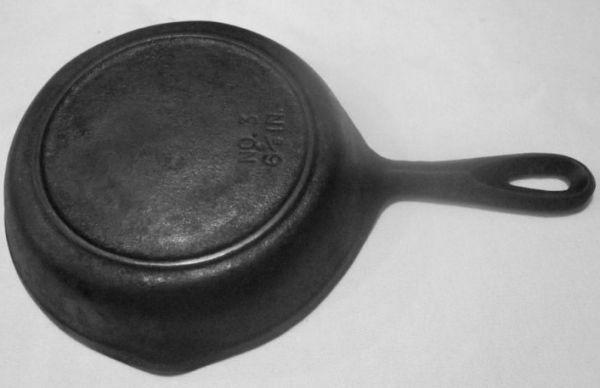 Much of what's known to collectors as "unmarked" cast iron has quite a bit to do with marketing. 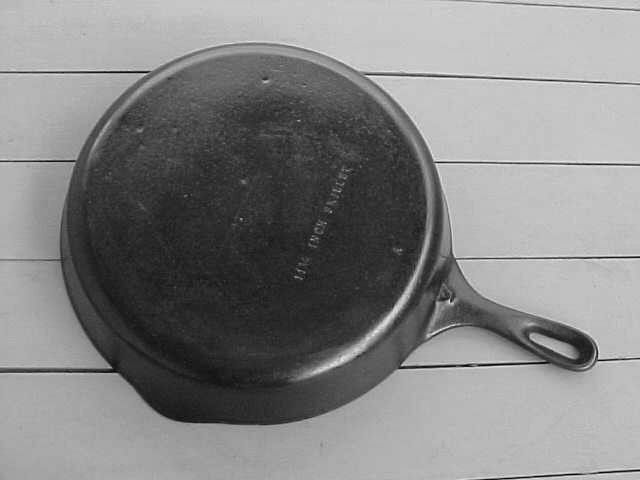 In addition to store brands, like those made for companies such as Sears Roebuck and Montgomery Ward, several major foundries produced unmarked versions of their goods for sale in hardware, department, and building supply stores. 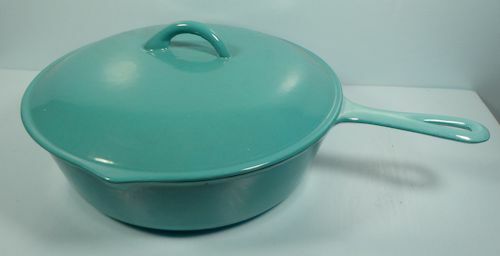 As such, these no-name pieces could be sold at a lower price without sacrificing the brand image and value of their main product lines. 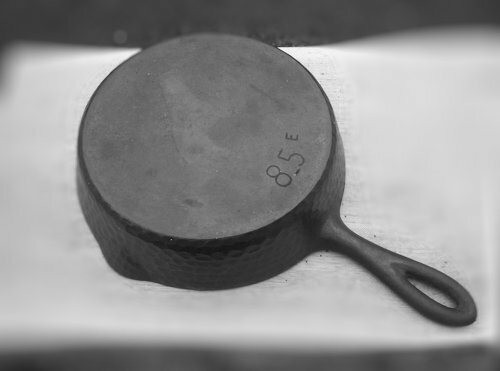 Product differentiation in the various channels was achieved by the use of paper labels affixed to the unmarked iron. 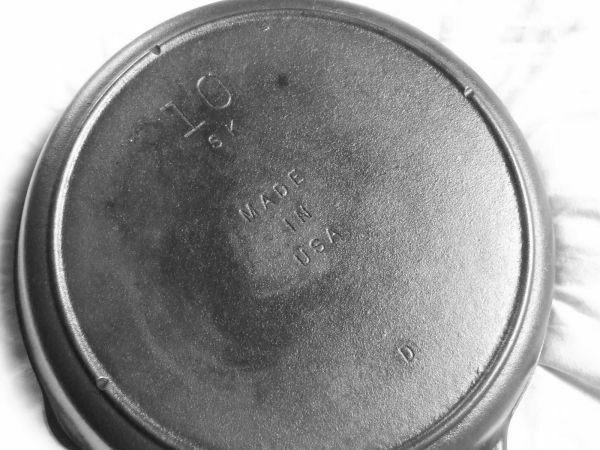 A couple of manufacturers actually made the decision at some point to cast all of their pieces without trademarks, instead relying totally on the adhesive labels. 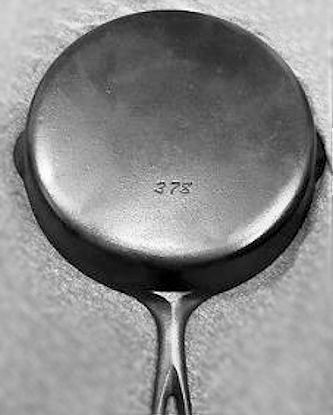 What's interesting about unmarked pieces is they are typically similar if not equal in quality to their marked counterparts. 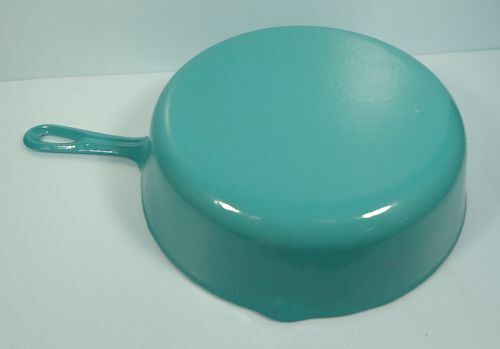 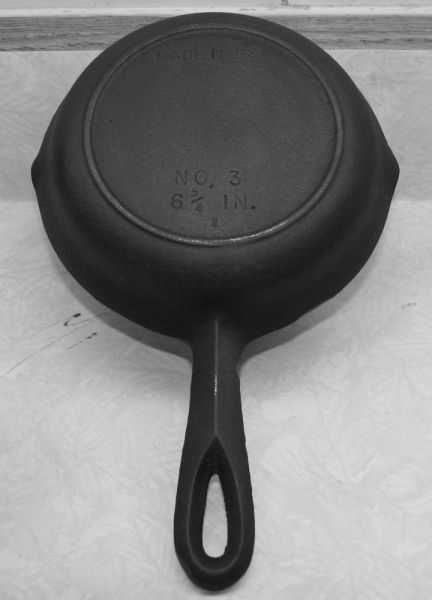 While the majority are not considered collectible, per se, they can represent excellent value as "user" pans, and can usually be obtained at a fraction of the price of comparable fully-marked ones. 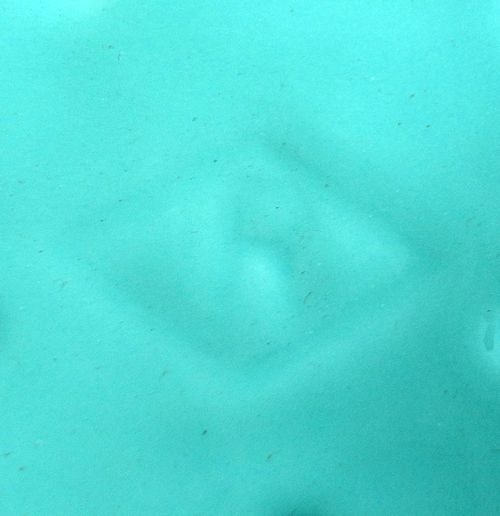 Here are some unmarked pieces you're likely to see, and information on how to identify who made them and when. 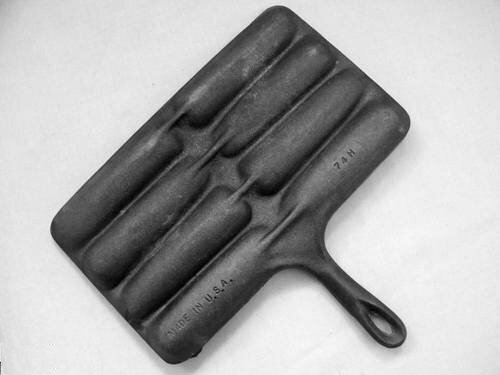 Some of them actually enjoy collectible status. 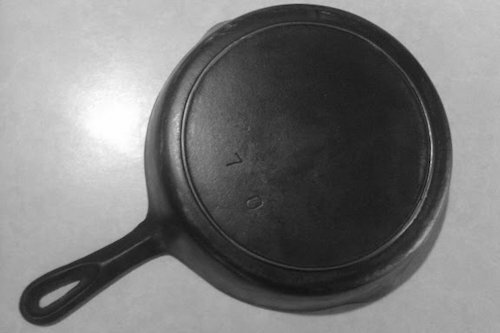 Bear in mind that, as with marked pieces, transitions between designs did not necessarily occur abruptly, so all dates given are generalizations. 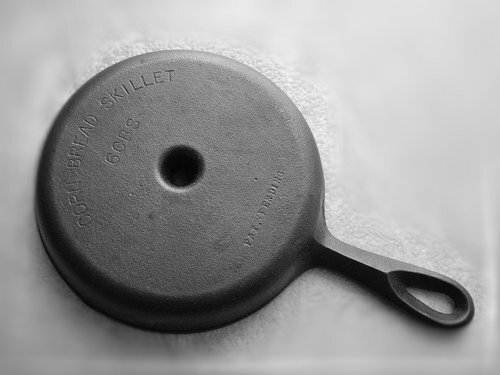 The characteristics described apply to skillets unless otherwise noted. 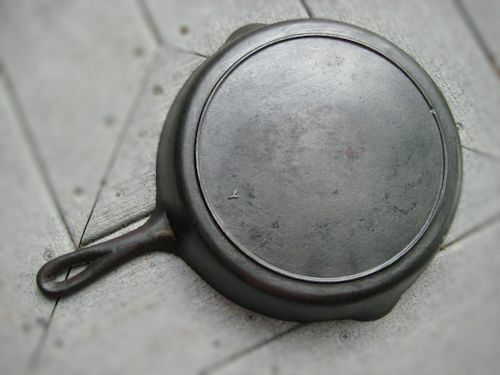 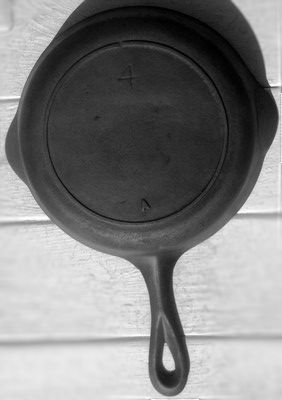 Dutch oven lids also have pour spout "ears"
A corn stick pan marked 74 with two rows of four and a skillet handle was sold as a "Handy Dan" corn stick pan. 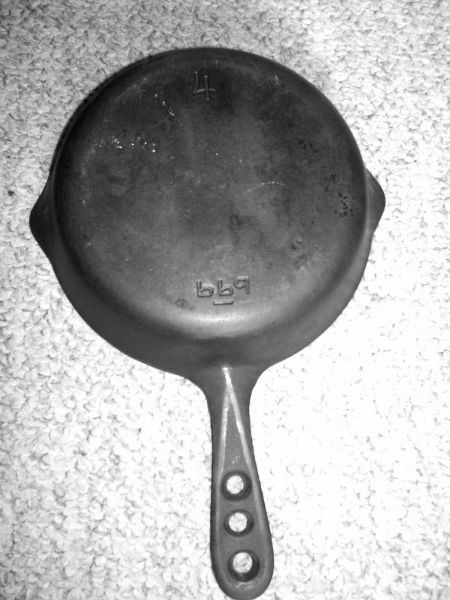 *Difference in Red Mountain and early Century series mainly a 1954 branding change. 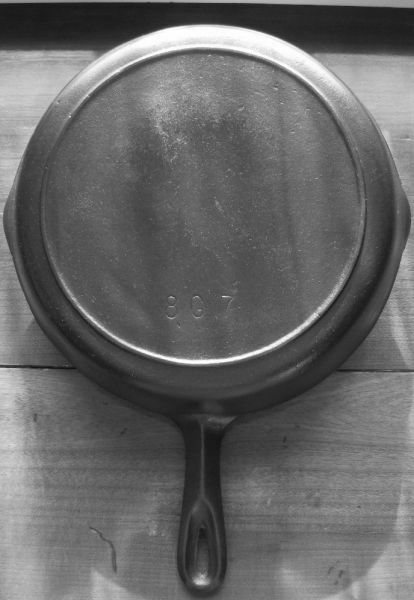 Pieces up to and including Century series may also have been sold branded as Atlanta Stove Works. 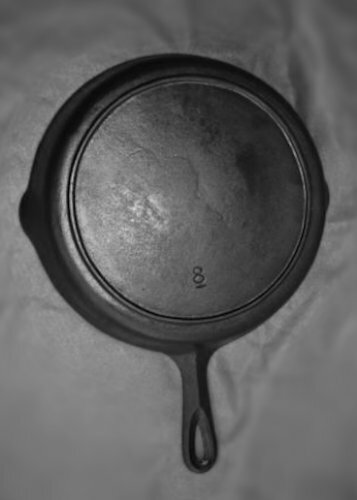 Descriptive name added below size e.g. 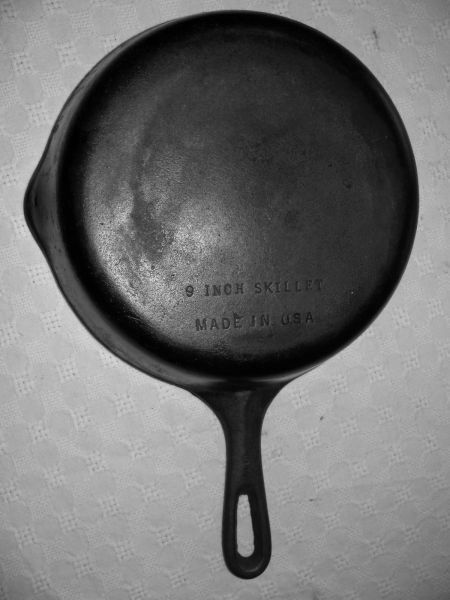 "Skillet"
² Lodge founder Joseph Lodge was a partner in The Blacklock Foundry, predecessor to Lodge Mfg. 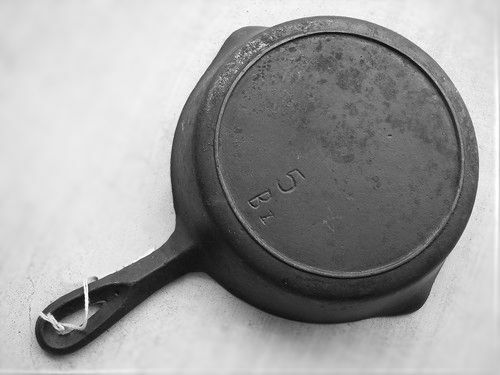 Co. That these characteristics describe a Blacklock skillet are conjecture, as no marked Blacklock skillets are known to exist. 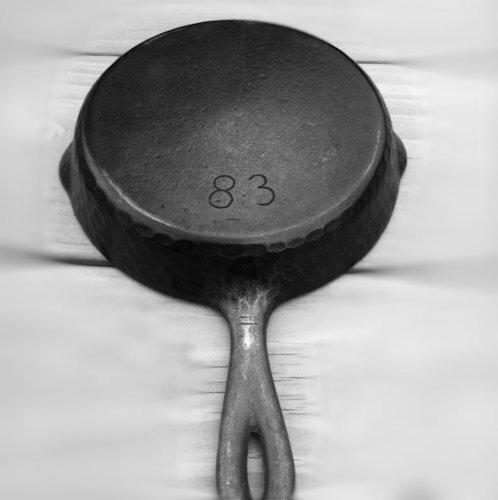 A collector guide book includes a photo of a skillet with the above characteristics in its Lodge section and asks "could it be from the Blacklock foundry", but with no further elaboration. 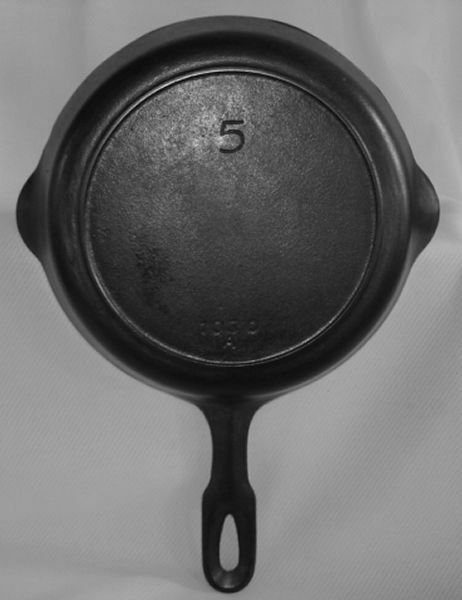 Collector groups have attempted, inductively, to fit skillets with these characteristics into the Lodge timeline. 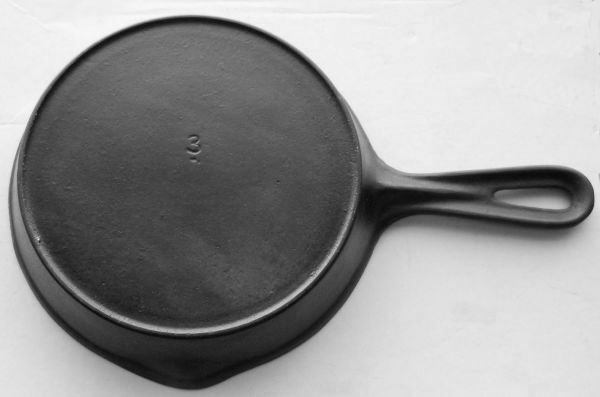 Skillets have inset heat ring with single notch opposite handle at 12 o'clock. 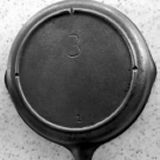 Skillets have inset heat ring with 3 notches at 9/12/3 o'clock. 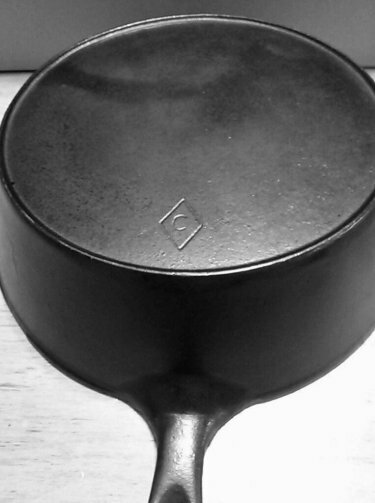 Krane Manufacturing Co. - St. Louis, MO sold this unmarked enameled chicken fryer and other pieces in the 1960s. 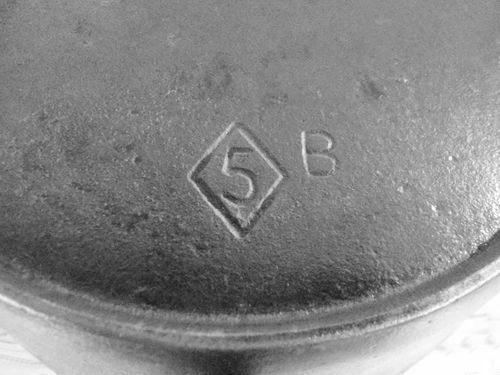 Although in most all other respects like BSR, the underside of the handle is grooved; lids are inscribed with an R inside a diamond. 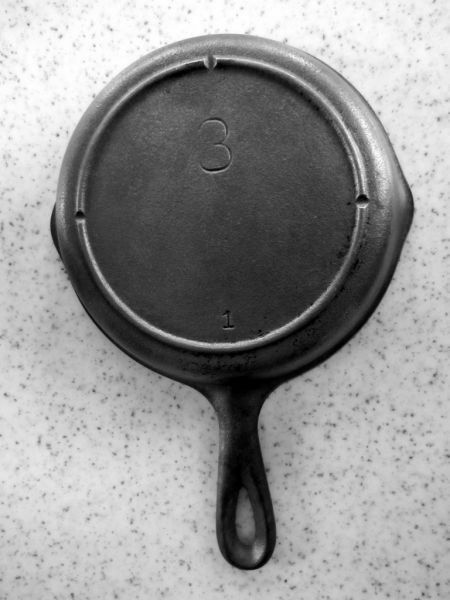 Some unmarked pans for whom the maker is unknown are seen frequently enough to merit inclusion here. 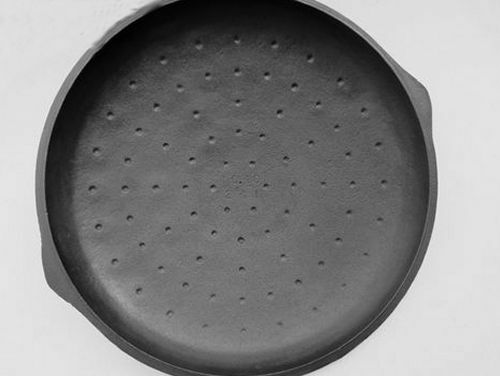 Lids have raised size number on top, pour spout "ears"
While unmarked pieces produced by the major name brand manufacturers can often be identified, those made by the myriad small foundries of the 19th century and earlier usually cannot. 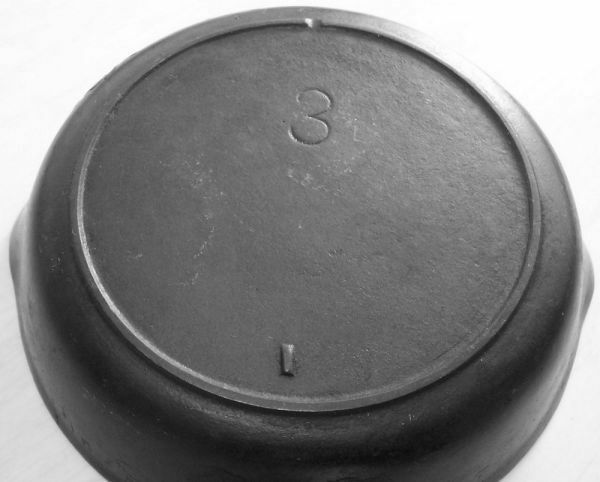 Knowing exactly who made these early pieces and when is more-often-than-not impossible. 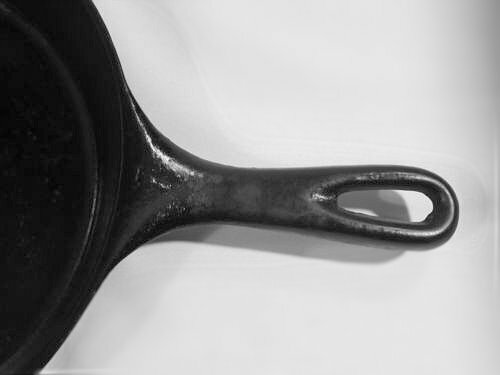 Typically, the only characteristics which distinguish these older pans are confined to molder's marks (usually the foundryman's initials), a decorative handle design, or the shape and style of the bail handle attachment ears. 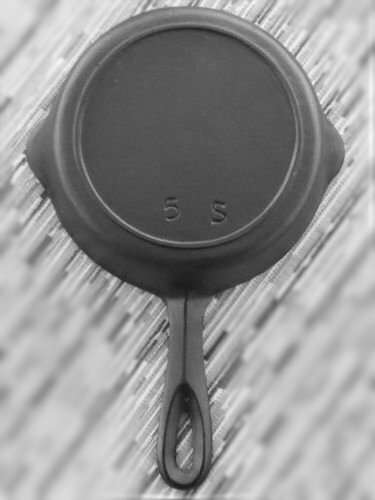 Sometimes, certain designs can be narrowed down to a particular century or part thereof, or to a geographical region. 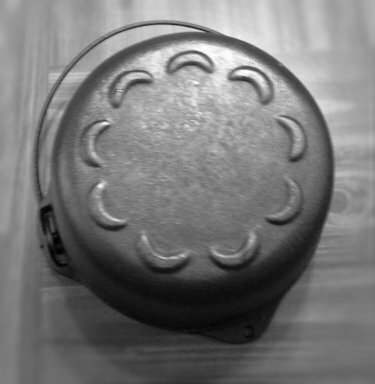 Or, if there are marked counterparts of identical design and dimensions, they may provide a clue. 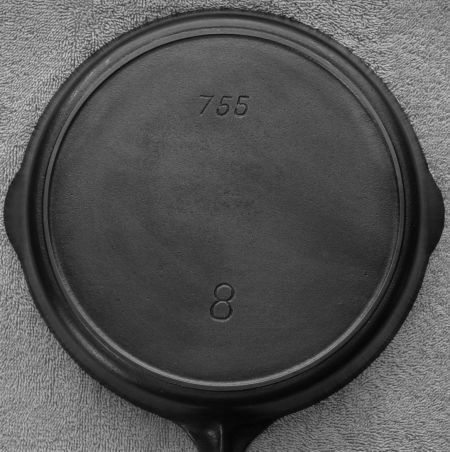 Gate marked bottoms are often an indication of late 18th or 19th century production, however, use of the technology continued into the 20th century on large format pieces like sugar kettles long after the majority of cookware manufacture had moved to side gating.